That was Steve Irwin. The Crocodile Hunter. Full-on. Unstoppable. Fearless. Peerless. He has swum with sharks, faced down leopard seals, walked with rhinos, bantered with big cats, wrangled crocodiles, been bitten, gouged, bled, bent and bashed by more animals around the world than you could poke a stick at (although, poking a stick at animals would be the last thing Steve would endorse). Though he seemed intent on thrusting himself headlong into the jaws and paws of danger danger danger, the world still somehow regarded this modern-day Tarzan as invincible. So the shock of his death still refuses to sink in. And the unnecessary circumstances behind The Sting Heard ‘Round the World is what must bring the insurmountable pain to the family he leaves behind (wife Terri, 42 and children, Bindi, 8 and Bob, 3): whilst muddy waters delayed filming on his current project, titled (prophetically, some might say) OCEAN’S DEADLIEST, Steve, the devoted father, decided to capture impromptu stingray footage for Bindi’s new nature specials, slated to air in late 2006. And then it happened. Ever the quick thinker, Steve actually pulled the stingray barb from his chest immediately, but the damage had been done, and he collapsed, never to recover. 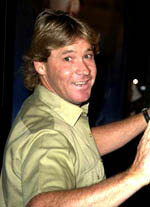 With a smile as sunny as Western Australia and an Aussie accent twice as broad, attired in perpetual khaki, Steve grew into the role of CROCODILE HUNTER through his early ’90s television series of the same name, produced and directed by childhood friend, John Stainton. As the series popularity skyrocketed, Steve and Terri parlayed their celebrity into transforming the modest reptile park Steve’s parents bequeathed him in Beerwah, Queensland into one of the most popular tourist attractions in the world, Australia Zoo. (In 2006, the lunch room alone seats 1,500, while the Crocoseum Stadium capacity pushes 6,000. 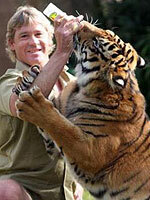 And of all Australia Zoo’s attractions – Steve himself became the biggest draw.) And from that largesse emerged Steve’s thriving role as self-proclaimed Wildlife Warrior, single-handedly invigorating wildlife conservation awareness with his dynamo stomp. I still laugh hard at his reckless enthusiasm, valiant malapropisms and emphatic emotional outbursts. It was this very emotionalism and unbridled desire to share personal space with animals that garnered Steve detractors, not necessarily to his cause, but to the way he presented it – almost as a caricature of a naturalist. The accusations fly ignorantly and uncorroborated, in the same manner that Italian anti-defamation lobbyists criticized THE SOPRANOS for demeaning Italian-Americans – having never watched one episode. 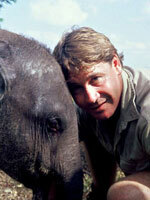 Likewise, claims of taunting, drugging and abusing animals, made by jaundiced activists, only prove they too have never actually seen Steve in action on his adrenalin-charged shows, where he constantly advocates nothing but stress-free and drug-free interaction with animals during handling, rescuing or scientific research. Unlike virtually every zoo’s animal shows around the world, Australia Zoo’s animals are not “trained” to do “tricks” (read as tortured into learning how to work for food), but rather (when they are taken out amongst the public), shown off as carefully and compassionately as possible, or (as with the predators) fed in the manner that psychologically benefits them – with Steve’s crocs, that involves ambush attacks on Steve proffering meat chunks. Wearing his emotions on his khaki sleeve, Steve weeps frequently and openly when speaking of his love for family, friends and animals. (When his son was born, Steve held him aloft like Kunta Kinte to the gathered zoo staff, and whilst someone off-camera made the happily astounding observation, “The future director of the zoo,” Steve could not contain his weeping, “Mate, he’s so perfect, it’s scary!”) Again, it is astonishing how detractors will selectively read whatever they want into these displays, accusing him of “acting” emotional. But as anyone will tell you, who has seen Steve’s movie, CROCODILE HUNTER: COLLISION COURSE (2002) – it’s pretty obvious he can’t act! Though Steve Irwin has become synonymous with the term “Crocodile Hunter,” more significantly, he has made the term “hunter” synonymous with “conservationist”! 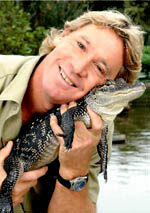 Whereas hunters used to be poachers and gamers, the children of this generation equate the term Crocodile Hunter with this compassionate man who did nothing but RESCUE and shower LOVE on his captures, many of them notoriously unloved and painted as villains in nature documentaries. Like the Carl Sagan of naturalists, Steve was the Great Popularizer – surely not the first to soapbox about conservation, but now its most identifiable proponent. Once again, his detractors chime in with the observation that his early television shows were markedly absent of the conservation message, accusing him of latching onto conservationism to palliate his intrusive actions on the environment he purported to love so much. But he was a conservationist since his first leap onto the back of a croc at 9 years of age – it just wasn’t called that back then. Only later in life did he realize he would have to put a name to his derring-do. The name of what he was doing all along was – Conservation. Are there better ways to approach conservation than Steve’s one-on-one approach? Sure there are. But not in the way you’re thinking. The very concept of zoos, animal reserves or nature documentaries is paradoxical from the outset. In its purest form, conservation itself is a slippery slope – how far would you go in sacrificing HUMAN wellbeing for animal wellbeing? The same argument should be used for so-called “alcoholics”: if you don’t want to get drunk, don’t drink. Likewise, if you want to leave animals alone, leave animals alone. That includes not observing or filming them from afar, not studying them or attaching radio receivers, and not encroaching upon their habitat. By definition, ALL these actions are intrusive on an ecosystem’s natural balance. Unfortunately, humans cannot leave well enough alone. Our nature is intrusive – more than AIDS, herpes, avian flu or Britney Spears trailer-trash bytes, humankind has become the Earth’s deadliest virus. And the paradox remains that the least intrusive of us have to be intrusive in order to educate the mindless hordes on how to be NON-intrusive. with such a big heart – how could the stingray miss? So why DO we love Steve Irwin so? We love him because of his uncluttered innocence. His good friend and director of the CROCODILE HUNTER catalogue, John Stainton, forbad him to censor himself onscreen so, like a child, he purveys a purity we wish we either had or could cull from people we do business with. And, like a child, his passions are unadulterated; his love is still untarnished, his laughter is still unforced, his accent is still unthinkable. And he’s got a hot American wife. 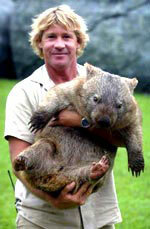 Terri Irwin must have weathered anxiety akin to a cop’s wife: never knowing whether Steve would walk back in that door. Unlike a cop wife, Terri was by her husband’s dangerous side most of the time, parlaying their relationship onscreen into the chemistry partly responsible for the success of the CROC HUNTER series. How did she live with the inevitability that any day Steve could die by the sword? There is footage of Steve’s last moments – he insisted to his crews that even if he was being killed, they were never to cease filming – and debate rages on whether to release it to the world, as would have been Steve’s wish. It must be horrific to watch: one minute, there is that inexplicable thing called Life; the next, there is not. And I wonder what went through Steve’s mind in the seconds before circulatory shock overtook him, in that disturbing shadowland between life and death, as he pulled that barb from his chest? During the desperate efforts to resuscitate him – just what were his last thoughts before the synapses stopped firing? He was the first to exclaim he was “the luckiest bloke in the world,” as fortunate in business as he was in his personal life, marrying a like-minded warrior queen and siring two beautiful and intelligent children, with his workmates fulfilling the roles of well-trusted surfing mates rather than employees; bodyslamming each day as if it WAS his last, living the equivalent of ten lifetimes, he actually DID die doing what he loved. I hope in those last moments Steve’s mind sparked with that vaunted “life-flashing-before-your-eyes” montage and was able to realize consciously that he was, in fact, dying a happy man. The passion of his message, the enthusiasm of his methods will give his idealism and his television shows great legs for decades; especially since his daughter is poised to enter the conservation ranks in her own right, to follow in his Herculean footsteps. Australian Prime Minister, John Howard, called Steve Australia’s “wonderful and colorful son,” Hugh Jackman called him a “colossus” (like his pal from the comics, a superhero by any other name…); to millions of kids Steve Irwin is a superhero. Steve tossed off the word “legend” as one of his regular hyperboles (“My dad’s the legend of the universe!” “This crocodile is an absolute legend!”). The word meant a lot, but it never meant what it really does. Until now. In one of those grand ironies, to a world still reeling in shock, Steve Irwin has become one of the greatest wildlife legends ON THE FACE OF THE EARTH. 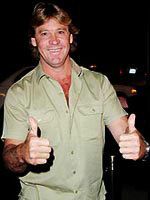 On September 4, 2006, Steve Irwin, The Crocodile Hunter, was killed by a stingray while filming at Batt Reef off Australia’s Queensland coast. Irwin’s crew speculates that the ray felt threatened due to Irwin and his cameraman unwittingly boxing it in, and in an uncharacteristic defense maneuver, the usually docile stingray lashed out with its serrated barb, stabbing Irwin in the heart. The stab to the heart, not the ray’s poison, killed him. Irwin died almost instantly. He was 44.
by Jon Dunmore © 11 Sep 2006.